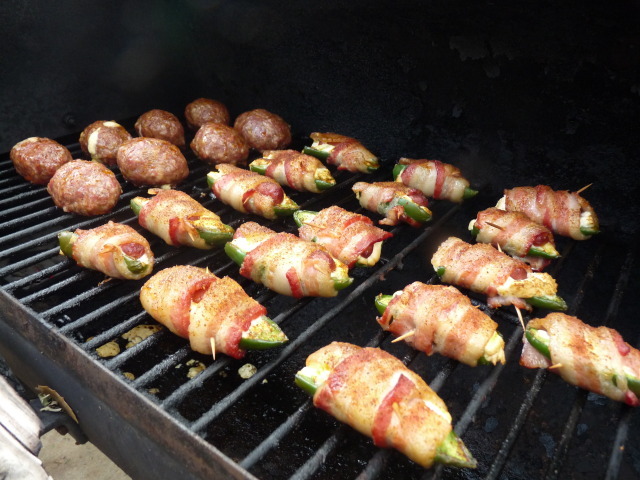 Atomic Buffalo Turds (or ABTs from here on out as the whole name is too long to type) are always a crowd pleaser at any barbecue, tailgate or gathering. I don’t know the history of them, where they came from or how they got their name. I tried to Giggle it (yeah, I call it Giggle, not Google, so what? ), but didn’t really come up with anything, just that they have been around for a while. I know I’ve been making them for over six years at least. Funny how I’ve never bothered to do a write-up on them before. One thing I will insist on…they are NOT poppers!! Poppers are battered and fried (and do not have bacon). These are not them. Go to a restaurant if you want those. So how do I do mine? I like to slice my jalapenos in half and then using a spoon remove the seed and veins. 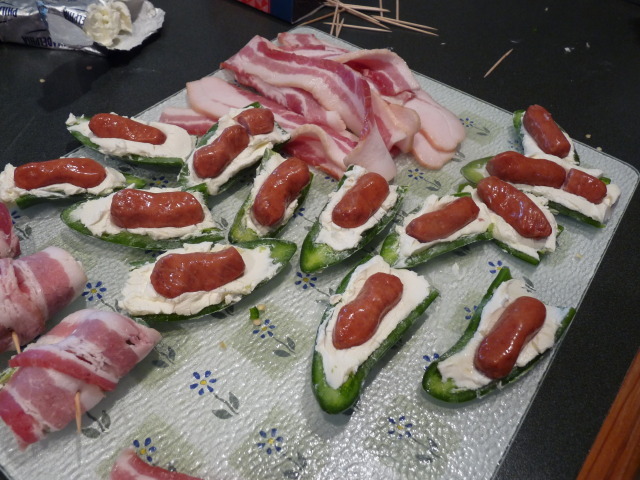 Next, fill the halved jalapeno level with your cream cheese (cream cheese and other cheese mixture, if you so choose). Then, we like to place a Lil Smokey on top of the cream cheese. 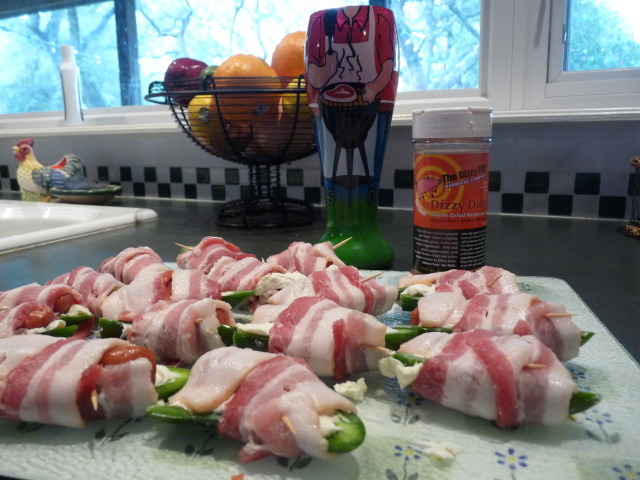 Wrap your jalapeno with half a slice of bacon and secure with a toothpick. Finally sprinkle your ABT with the BBQ rub of your choice. That is the original way I learned how to make them. Pretty simple, huh? Now they are ready to go onto the smoker. As with the Turtle Eggs we did yesterday, I don’t believe that you need to worry too much about how you cook these. I will say that they longer you cook them, the more they mellow out. I’ve done them at a high temperature in a gas grill and they were spicy!! 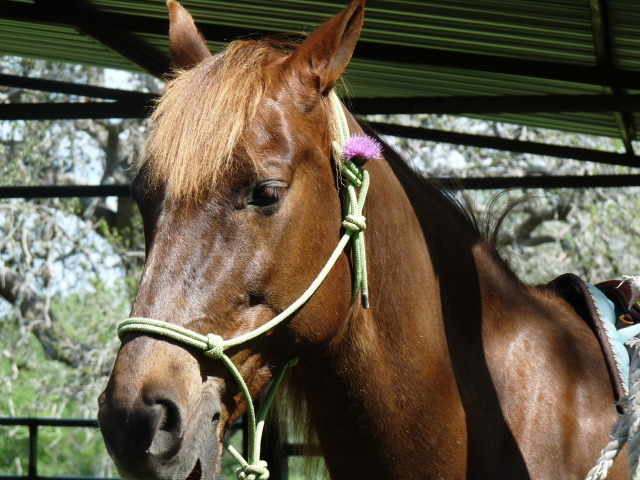 But if you take your time with them, the heat will not be overpowering. I generally like to smoke them in the range of 250-300F. 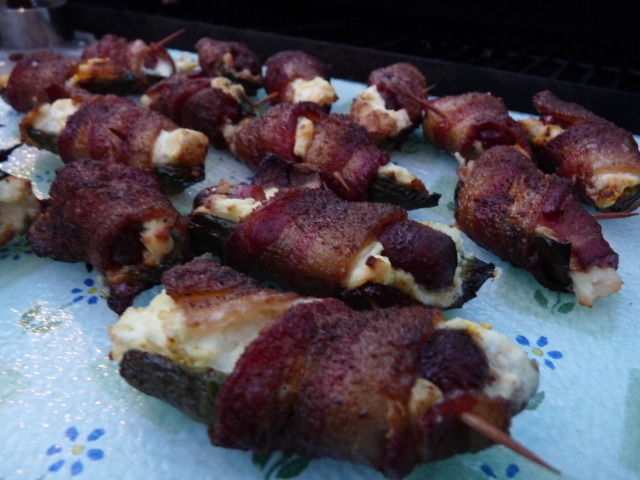 If you are using a gas grill, light one burner and then place the ABTs over the unlit burner (this is called indirect cooking, if you did not know). At 250-300F, they will generally take about an hour to cook. How do you know when they are done? Simple….when the bacon has become crispy. How crispy you like your bacon, I’ll leave up to you, some like it more done then others. Now that they are on the smoker, you’ve got some time on your hands to kill. Pour yourself a drink. Sit down, relax and talk with your friends and family. And maybe if you are on a ranch, and maybe if you just picked up a used 1948 Remington 511 the week before and maybe you are just dying to shoot it….then go ahead. But that may just be me. I generally check on the ABTs after about 30 minutes, just to see how they are doing and if they need to be rotated around to ensure an even cook. The ABTs took awhile longer than the Turtle Eggs to cook. Reason being I had a pretty hot pile of coals going in the offset chamber of my smoker and the Eggs were closer to that. But like I always say, its bbq, not rocket science. And as long as you have something for the masses to nibble on while they wait, it’s all good. As usual, once I pulled the ABTs off, everybody crowded around to get some. I believe there might have been a few burned tongues as some people just can’t wait for them to cool down before diggin in. The horde had been appeased long enough to get the rest of the dinner started. Once you’ve done these a few times, let your imagination run wild. Why not pulled pork or brisket mixed in instead of the Lil Smokey? Shrimp would be good. You could go another route and maybe mix in some fruit. I imagine pineapple might be a good addition. Whatever you think sounds good. The sky is the limit. One side note, it might sound like a good idea (or at least a laugh), but do not ever, ever, ever make them with Habaneros. Unless you are just a glutton for punishment or have no taste buds at all. Once again, trust me on this. I did it ONCE….ONCE and NEVER again. We call them wienie poppers. You totally caught my attention with the title, I had to see what you were talking about! 🙂 My uncle makes these without the weenies. He sprinkles cooked bacon on top and we eat the jalapenos uncooked. But I’m going to have to try your version! Well I’m gald I got your attention. I have no idea where the name came from, they’ve been around the BBQ world for ages. I hope you try it and let me know how you like them. That’s hilarious—we eat these all the time, but I have NEVER heard them called by that name…In fact, I don’t think I have ever heard them called anything…..We use cream cheese and shredded cheddar mixed together, and we baste them with bbq sauce, but I have never seen little smokies in them–my hubs will LOVE that. Seems like everybody had a recipe of their own for them. I’ve never basted them before. I’ll have to try that. That’s what they call them on the BBQ circuits and BBQ Forums so that’s what I’ve always called them. we need to try these, they sound awesome! Very tasty appetizer. Your guests will love them. I suggest you wear gloves when preparing them, especially in larg batches. What! I must have some. They look amazing. 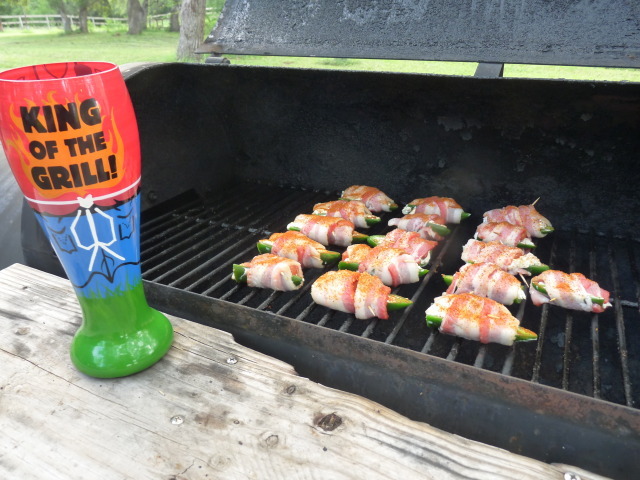 I mean, I’ve made stuffed jalapenos, but never with a turd in the center. Love it. My husband is going to flip when I tell him about these. That’s how I learned how to do them. Now step outside the box and think of what else could go in them….maybe some shrimp. Pulled pork. Sausage. Taco meat. Whatever you can think of. I think I’m going to try some with pineapples in them this weekend. love me some pineapple. OMG, yes! All of it sounds good. How about pineapple and sausage? love that combo. You’ve created a monster. I’m going to be making these all the time now. Oh that could work. Or like a hawaiian theme…pineapple and ham/canadian bacon. Now you got me thinking, too. Okay. WHAT?? I can not top laughing about the name. But it looks like a delicious little treat – well done! I didn’t come up with the name, I promise. 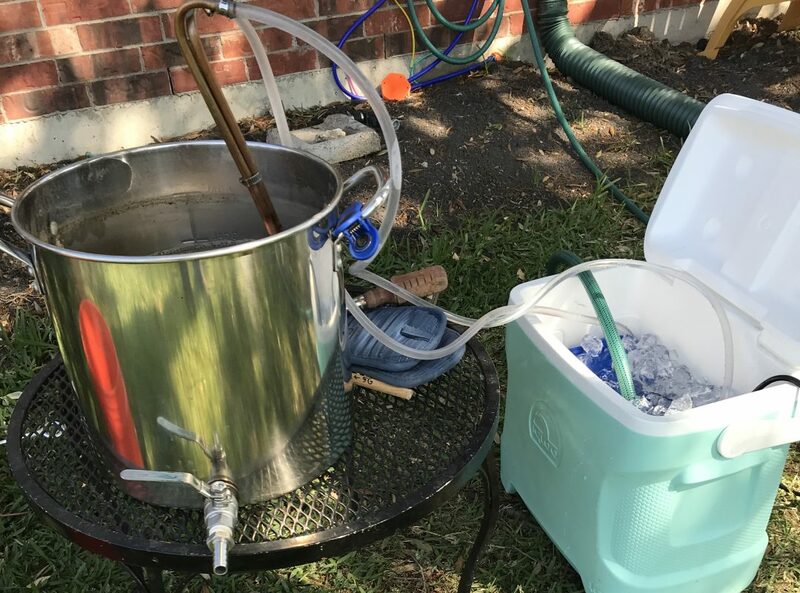 It’s been around for aloong time on the BBQ circuits and forums. 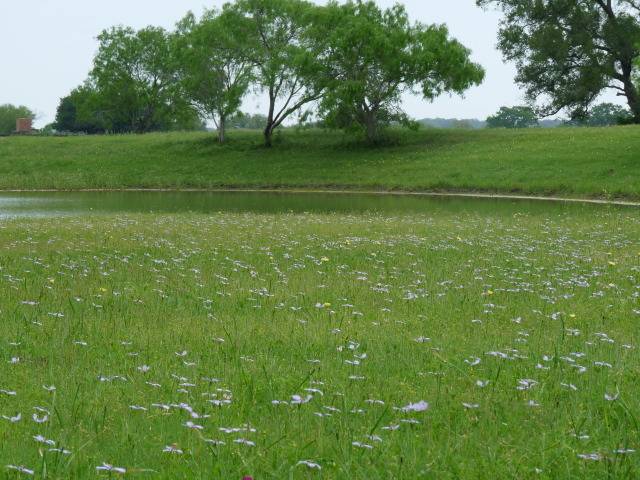 That first photo of the field made me wonder if the ABTs were some relation to cow patties and you were showing me the foraging area. I’m glad I was wrong. 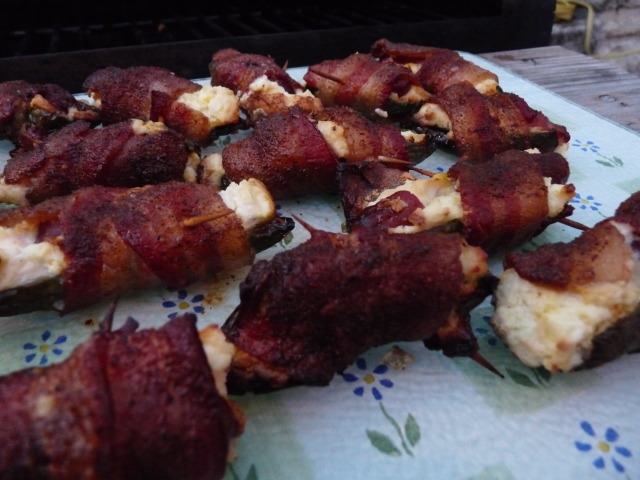 The smoked jalapenos are much, much tastier sounding. I’d take mine wrapped in meat candy. Only way to go. Thanks so much for the recipe and entertaining read! I hadn’t even thought of pairing them with meat candy. You might just be a genius!! The Mercedes? Not sure. That’s my Father In Laws. Early 80’s, I think. 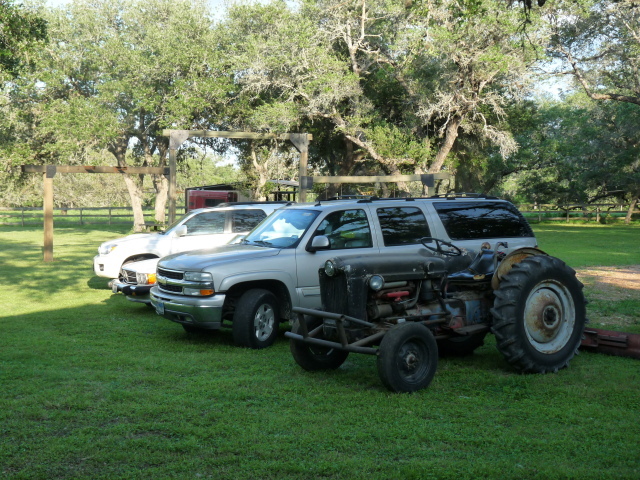 I got a chance to drive it around last month and does that thing get up and go! I have an ’87 and you do have to watch yourself! Im going to have to give these a whirl. Youd think I would have done these before but I havent. Ive only done moinks! Nice grouping! I need to get my son’s .223 sited in, thanks for the reminder. Great looking ABT’s! I never get tired of those things. If you ever have a few leftover (yeah, I know…IF), slice them up into rings and serve on an Egged pizza – that is all kinds of awesome. Thanks. 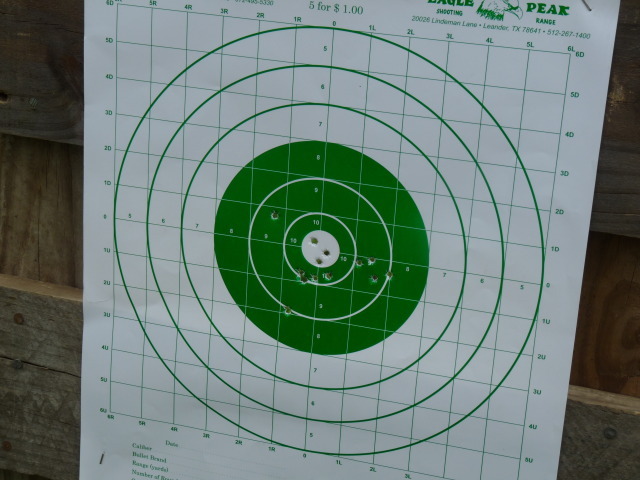 I recently picked up a Remington 511 (.22 caliber) from 1948 and that was only the second time I have shot it. Not bad, considering its only got iron sites on it. That’s a good idea, but we don’t ever seem to have any leftover. There are some other things you can do with them that I do with mine, IF we have any left over. The first thing I did with mine that was a huge success was to get some crescent rolls and put an ABT in the middle of a cresecnt roll. Then wrap it around the ABT just like you would when making a crescent roll. Pop it in the oven and bake until the crescent roll is done. It is like a pig in a blanket on steroids!!! Another thing I do with these is when I make homemade flour tortillas, I put one in the center of the tortilla and roll it up like and egg roll. I then throw it in the deep fryer and they are damn good as well! And the other big hit I did with these was to throw the left over ABT’s in a food processor…take the now ABT “paste” out of the food processor and spread it on some bread, preferably french bread and broil it in the oven. I like to think of this as a mini ABT pizza…good eats for sure! Interesting ideas. Thanks for sharing those. Forgot one thing…add some Tiger Sauce to your ABT recipe…I blend some in with my cream cheese. I leave the cream cheese out at room temp for a bit to soften it up, then I take the whole block and add some Tiger Sauce and then hit it in the microwave for about 30 seconds to get it soft. I use the cream cheese instead of the whipping stuff as I can get cream cheese on sale, sometimes as cheap as 50 cents! If you haven’t tried Tiger sauce, pick some up soon – it is GREAT on just about anything! These sound awesome! I am inwardly wincing just thinking about doing them with habenaros however! OUCH! Why does this look so good? I REALLY want to make this. They look great… love the name!! A little labor intensive, but so worth it. You could probably aslo make these in an oven if you don’t have access to a smoker or grill. I’d try 350F. As for the name….I didn’t come up with it. Griff, add some honey to your cream cheese and then sprinkle Dizzy Pig Pineapple Head over the wrapped ABTs before cooking. Whole new level. Sounds good, I’ll have to give that a try.